Red Canyon is a little known gem located 4 miles east of Highway 89 and 9 miles west of Bryce Canyon. Red Canyon is a forested area with sixty-million year old dark red rock castles protruding up from crimson sand. Schedule some time to explore Red Canyon. This area is regulated by the Forest Service and thus allows ATV's, horses and bicycles on the trails. There is no entrance fee since this is a part of Dixie National Forest rather than the National Park System. History and lore of the old west are alive in Red Canyon, thanks to Butch Cassidy, who was raised nearby in a cabin in Circleville where he lived from 1879 until 1884 . Rumor has it that when Cassidy was in Panguitch at a dance he got himself into a brawl over a girl. Cassidy thought he killed the fellow and fled to the craggy land where Red Canyon is today. Turns out the man he knocked out was just fine, but a posse was already sent out after Cassidy. He eluded them by hiding along what is now known as the Cassidy Trail. Red Canyon is not quite as famous as old Butch, but it is part of the vast 2-million acres that make up Utah's most famous forest, Dixie National Forest. Red Canyon allows ATV's, cross country skiing horseback riding and even dogs on the trails. If you are looking for a user friendly area to relax, camp and enjoy, then look no further than Dixie National Forest's Red Canyon. 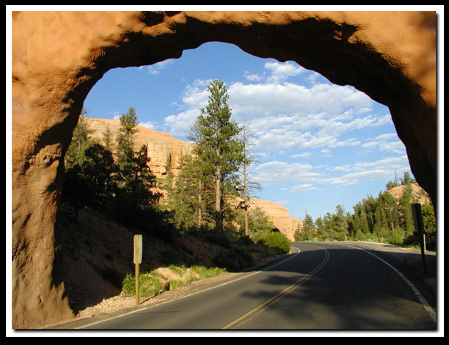 The paved bicycle path that runs along Scenic Byway 12, is a beautiful and safe way to explore Red Canyon. It runs from the Thunder Mountain Trailhead to Coyote Hollow Road. The elevation along the trail is approximately 7,200 to 8,000 ft. There is no lack of recreation in Red Canyon for bikers, there are 34 miles of single track, mountain bike trails in Red Canyon to explore. The Forest Service offers a nice 38-site campground that is shaded by ponderosa pine, juniper and a few Douglas fir. This exceptional campground has flush toilets and hot showers. Sites are on a first come, first use basis. A stargazing program is offered on some nights. Call for dates and times. The dark, clear skies of Red Canyon are a perfect backdrop for stargazing. The Red Canyon Recreation area is 41,431 acres containing Red Canyon, Casto Canyon and Losee Canyon. Red Canyon is located between east Zion and Bryce Canyon making it a must do stop on your Utah vacation. Since Red Canyon is only 9 miles from Bryce the fauna is similar. The forest and rocky areas of both Red Canyon and Bryce Canyon offer about the same environment. Animals, such as the least chipmunk scurry about often unnerved by humans. Mule deer, ground squirrels, bobcats, ringtail cats, foxes, hawks, elk, Utah prairie dog and even the golden eagle all have a place in Red Canyon.